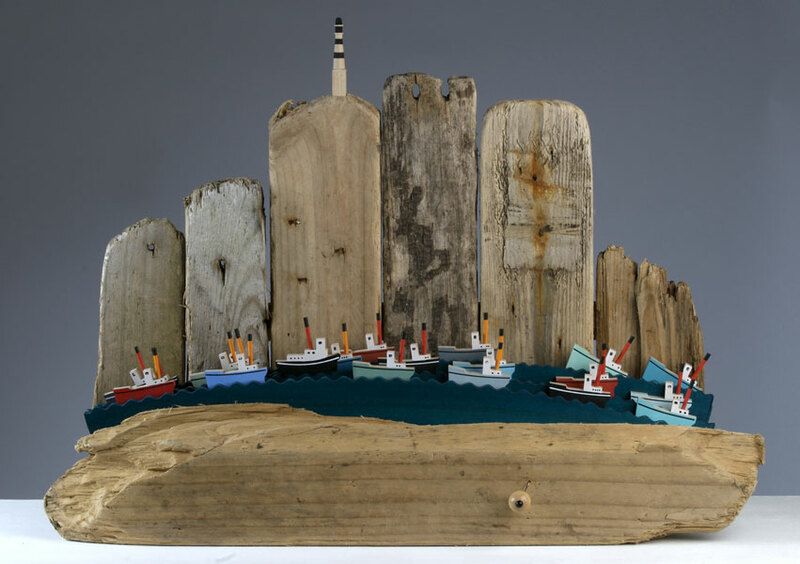 Ian McKay worked in a range of fields including ceramics, metalwork and furniture-making, before making automata, and these various experiences explain his technical skill and obvious pleasure in working with different materials. 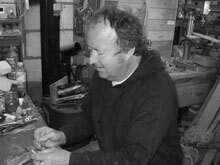 He is proud to be labelled a toymaker and his approach to his work is refreshingly unpretentious: he says his beautifully constructed, frequently quirky and always eye-catching automata are ‘just something I make’. 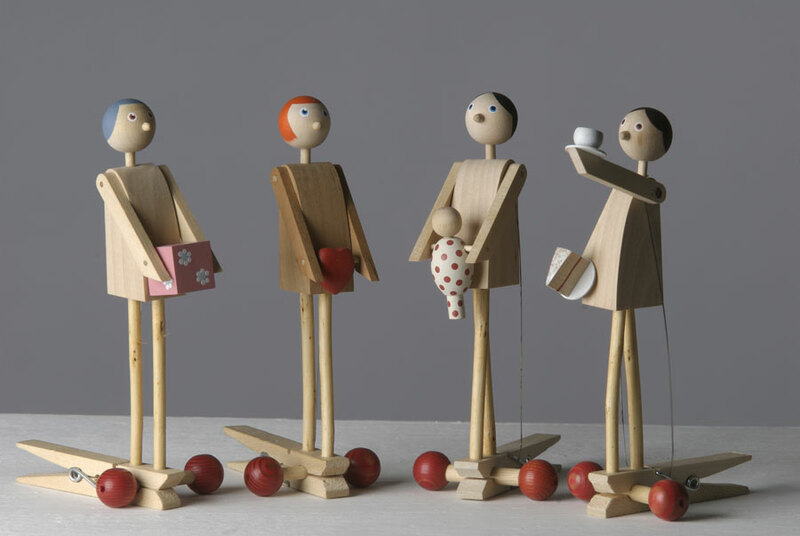 You have done a lot of things in your life, can you explain how you ended up as a toymaker? I started off studying furniture at High Wycombe and had a desperately unhappy time there so when they started the ceramics and glass course I immediately switched. There were only two of us on the course – we were guinea pigs really – and we had a fantastic time. The facilities were brand new and there were great tutors - it was really good fun. After that I worked as a ceramist for a time. The main thing I got from the course was the understanding that I liked different materials for different reasons. I liked ceramics because I was fascinated by the way clay was so elemental. What did you do after your time as a ceramist? I spent some time silversmithing and as a blacksmith. I’m a bit of a dabbler and love working with different things and materials. I’m interested in what you can do with different materials and what happens when you can’t take them any further. I suppose that is why I’ve worked with so many different materials. And that’s why I ended up making toys. I can use a variety of materials to do a variety of things and incorporate all the materials and techniques I’ve worked with in the past in an unpretentious, playful way. How important to you is the interactive element of toys? One of the joys of moving away from ceramics to toymaking is the different way people handle your work. People are quite wary of handling ceramics, but you have to touch toys to make them work, and toys can always be mended. I love watching how people interact with my pieces, how they play with them – they don’t have to be respectful but can have fun with them. The interactive element adds an extra emotional and physical element to the way people respond to my work which I think is an important part of it. How important do you think play is in adult life? Everyone has toys, everyone plays. My mantra is ‘play every day’. Life is very serious and I think it’s good to have a bit of light relief. Children use play to find out how the world works, while adults use it as more of a distraction. It’s interesting watching how people react to my pieces. Most of them want to have a go and the experience of playing with them is quite liberating, it acts as a kind of escape. How do you go about making your automata? I do a lot of drawing and sketching, but I don’t necessarily design a piece before I start working. The way I work is quite instinctive. I tend to grab bits of wood and play around with them. The making process is very important to me and I get a deep thrill out of it. I like using all materials, but wood is the material I’m using most at the moment, especially driftwood. I love the contrast between the sea-worn driftwood and finished, painted wood. I like the way driftwood has a history: it starts as a tree, is then planked up and made by man into something and then the sea takes it back. I particularly like working with driftwood that has almost ceased to be and is crumbly and full of sea-worm holes. It works very well with my subject matter, and I enjoy the whole process of gathering it, looking up the tide times and making a special trip to the beach to find it. How important are the moving components of your toys? My pieces can work as non-moving sculptures, but for me the movement is an added bonus. I recently made a few pieces which don’t have a built-in mechanism so you end up moving them by hand to see how the different relationships work between the different elements. 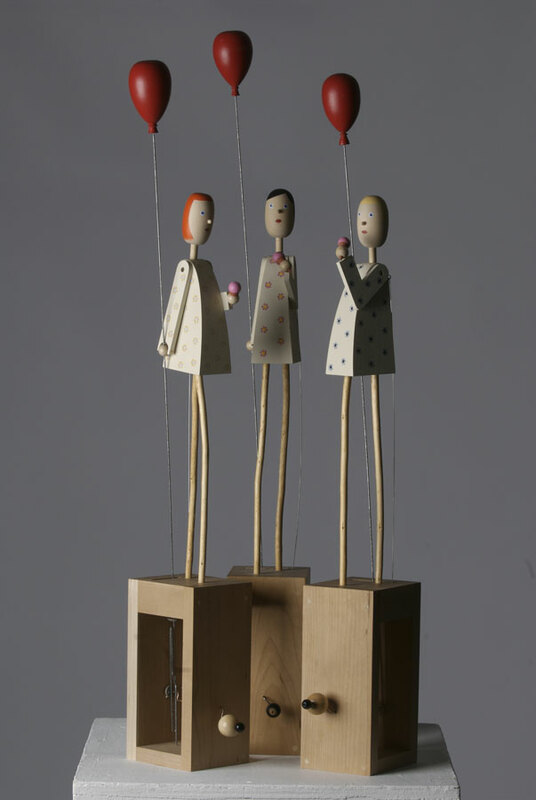 I made a few pieces for Origin a couple of years ago and people looked at them without realising that they moved at first and when they found out they were automata they were really excited – the movement adds a whole extra layer to the work. How do the mechanics of each piece fit in? The mechanisms I use are quite simple – I’m not particularly mechanically minded and don’t have an engineering background. They often work with just a simple turn of a handle. I like the rhythmical feel of a repeating movement. The pieces don’t tell a story like some more complicated automata, they’re more like short limericks. A machine does what you tell it to do, but I like the extra random elements, so I include elements that wobble or are loosely attached so there is always a possibility of some mechanical accidents. Do you find the mechanics restrict your designs? My work is quite 2 dimensional or theatre-like as it’s composed in a series of layers. This format is often dictated by the mechanics of the piece and it’s quite difficult to break away from it. The mechanics dictate the shape and size of each piece and can be quite restrictive as you have to take into account things like gravity and friction. Comics and comic strips have been a major influence. Sam Smith was also a big influence – he’s the granddaddy of all toymakers – and I really admire the freedom of expression in his work. Another big influence is my family history. My father was in the navy – he joined when he was 16 years old at the end of the war – and it had a great influence on his life and the sea and boats are a reoccurring theme in my work. I like the elemental quality of the sea and I love sailing. I’m also interested in things that fly. Air and water are two elements that take you away from earth and are full of exciting possibilities so I quite often reference them in my work. What are the areas you would like to concentrate on in the future? 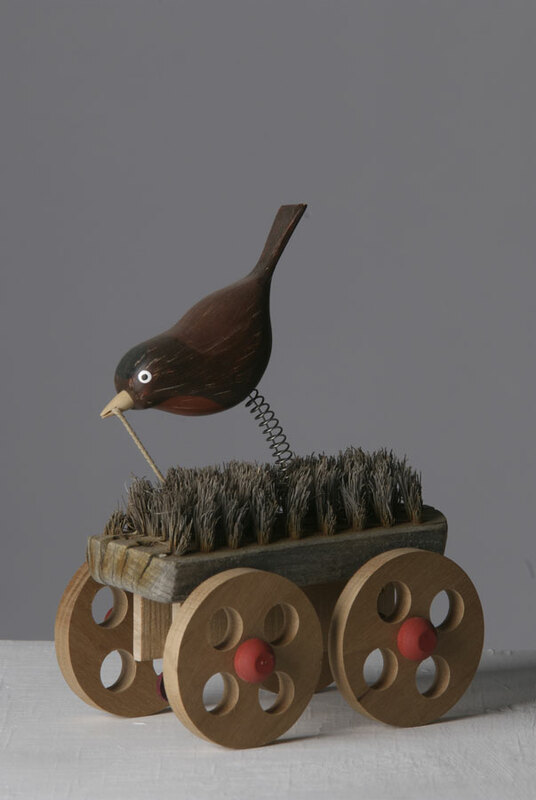 Although a lot of my automata are very playful, I do like toys which make a point. I would like to be able to make toys that had a political message, but haven’t yet worked out how to do this – it’s something I aspire to. I would also like to make figurative pieces in which the figures have specific characteristics and actually look like particular people. At the moment they look a bit like caricatures, but I would love them to look more like portraits.